June 15, 2015 #95 has a new name, Amaya and Scott Henry has earned his DFI badge. I found the 4th dolphin in Fortman Martina. On' A' dock, named Aviva. Sorry, no pictures this time. Also, my dolphin #95 has a name! "Amaya", named after a bottle nosed dolphin at a "swim with the dolphins" Event..
Webmaster Note: We set up that new page for Amaya - clicking on her name will take you there. August 7, 2014. Scott Henry has checked is as the new owner of Yankee #95. Here is his email and her picture. We'll set up a new page for her as soon as Scott tells us her new name. I just bought Will Kruse's YY #95 Dolphin. 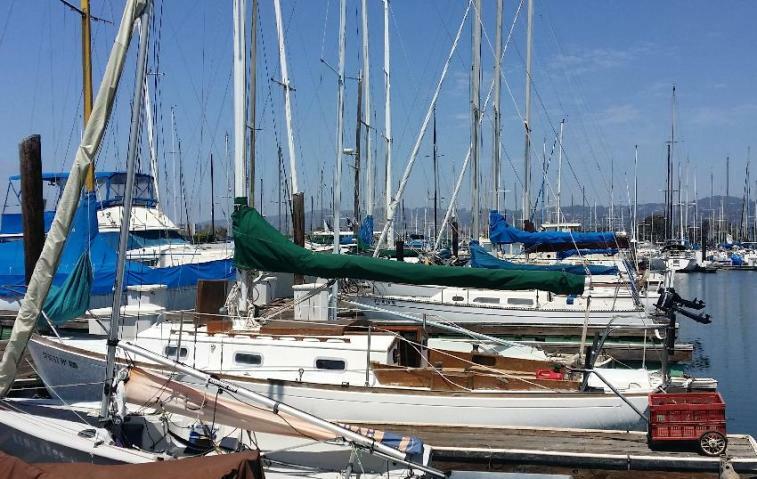 It is now living in Alameda, CA (on the San Francisco Bay) Less than a week in the water so far, one time sailing. No name yet. April 5, 2015. Your webmaster, on an unannounced inspection trip to Fortman's Marina on March 30, got these pictures of #95. This is what we had on #95 up to this point. May 16, 2014. 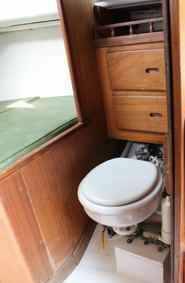 DFI John Cotton brought this Craigslist ad to our attention. Here is the link http://mendocino.craigslist.org/boa/4455376451.html, and below is the ad. 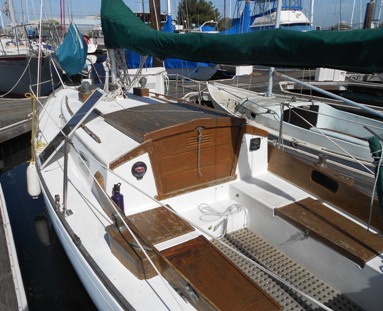 24' SAILBOAT, Yankee Dolphin, with trailer, nearly NEW auxiliary motor, fully equipped ready to enjoy. 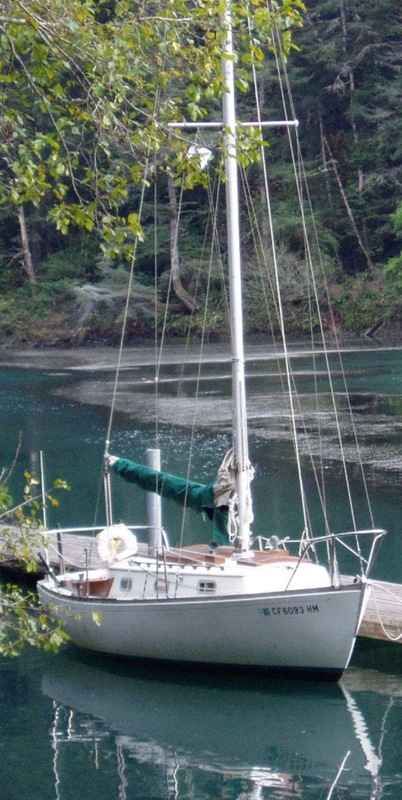 Located in Northern CA, Albion, near Mendocino, on tandem custom trailer. 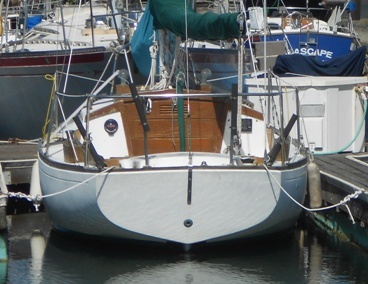 Beautiful Sparkman & Stevens, Yankee Dolphin Sailboat in very good condition, heavy hand laid fiberglass built by Yankee Yachts, ocean capable, built in 1968 and features classic bronze and teak trim, toe rail, and interior. Cruising full keel, draws only 3'. Condition very good. Mast and spars in very good condition. 3 sails, main with reef points, genoa, working jib all in good condition. Standing rigging is very good condition all upgraded with heavy stainless. 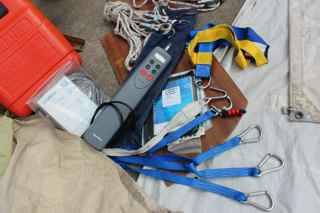 Running rigging in very good condition new and upgraded. 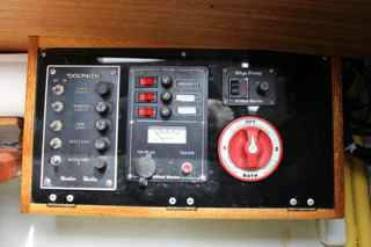 Electronics are upgraded, with new panel, dual batteries, amp meter, depth meter, knot meter, water temp, vhf radio, dual compasses, dual bilge pumps are upgraded and all in very good condition. Full wash decks, coast guard approved permanent porcelain head with holding tank. Full cruising gear package if interested: Life jackets, sailing harnesses, extra vhf, lifelines, foul weather gear for two, extra ropes and mooring gear, extra fenders, dual anchors and extra ground tackle, two sets of anchor chain, and more. . ..
Trailer included, custom trailer in good condition, dual axles. 2 5/16" ball. Round trailer electric connector, electric brakes on rear axle. 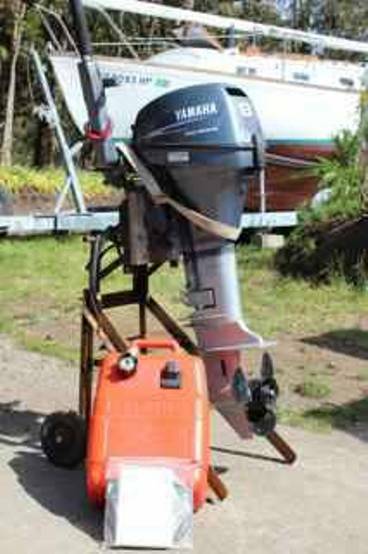 The auxiliary is almost NEW, low hours and kept OUT of the water, indoors, and more than enough power, 8 hp 4 stroke, electric start, alternator, long shaft high torque sail model. It fits in a built in motor well and feels like an inboard. Low maintenance fiberglass hull, with a classic Teak interior, dinette and bunks to sleep 4 people, cockpit and interior cushions are recently reupholstered. $9,500 price is negotiable. 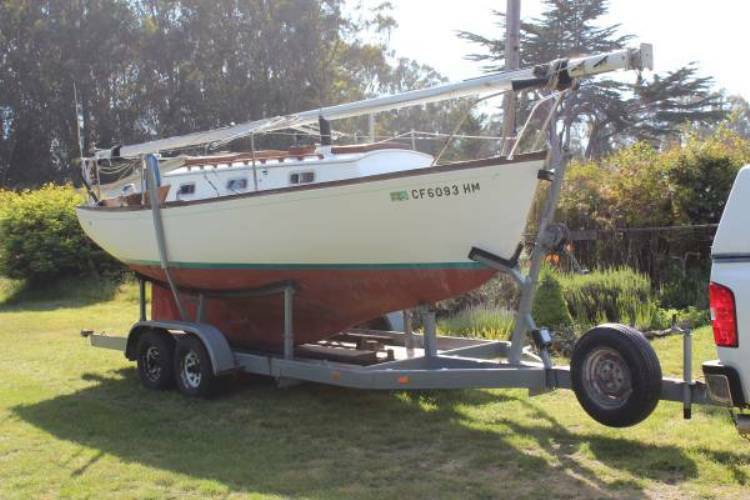 You can buy just the sailboat, or the package of boat, motor, trailer, fully equipped with lots of gear as listed above. 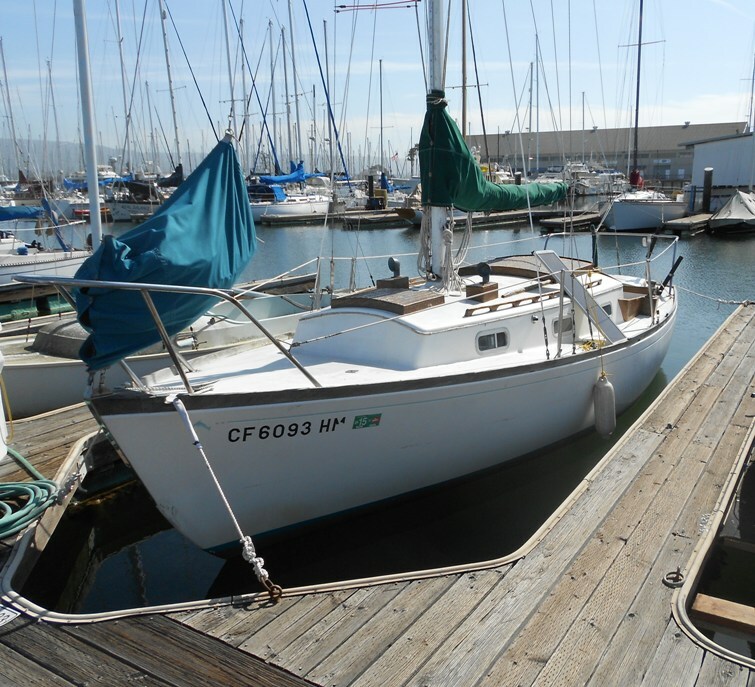 This is a very enjoyable boat to own, in the water it feels very solid, and easy to sail. June 4, 2008. Will Kruse checked in his 1968 Yankee with the following email. We knew about this boat from a 1999 archives email Steve Barnes sent in to Jim Huxford's old Dolphin 24 website, which follows at the end of this page. We await pictures of "Francis" and more info from Will. I am checking in for the first time. 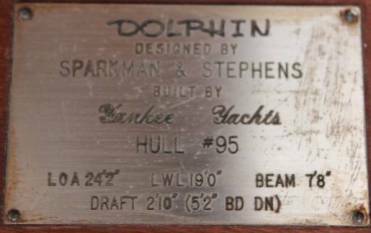 I own Yankee Dolphin hull #95, 1968 model. I purchased this in 2000, boat was located in San Diego, CA area, formerly named "Francis". Now the boat is mostly restored, located in Albion, CA, cruises open Pacific Ocean from Albion to Little River and Mendocino area. Glad the site is up, I'll keep in touch. Happy New Year to you. I will try to send a photo, Yankee is on my trailer, and has been for a year plus, life got complicated and several adventures have superseded any hope at sailing. I will make an effort to locate a photo, and forward sometime soon. Thanks for your email. January 6, 2014. We got our photo. Yo, Dudes! I just bought Yankee Dolphin #95, year 1968. It was a"donation" boat, needing cleaning, paint and varnish, but otherwise very sound. I am in San Diego, CA, and am keeping the boat in the Chula Vista Marina. Are there any other Dolphin owners in San Diego? I may have lots of questions over the next few months as I refurbish it. I was going to build a traditional looking wooden sailboat in the same size range, but this will save me a lot of time and money. 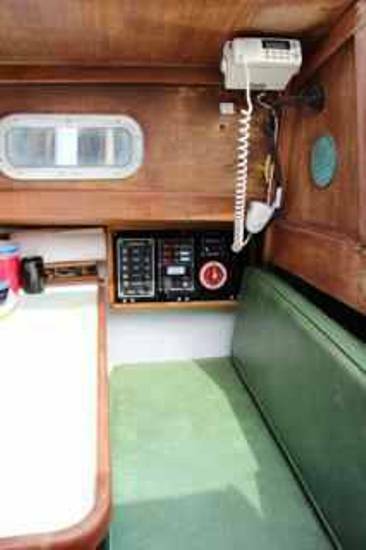 This Dolphin has very traditional lines and lots of wood, like coamings and hatch covers, etc, and lots of bronze fittings. The cabin walls, ceiling, cupboards, etc, are some kind of wood, too. Is there any chance of someone emailing me the color brochure? No documentation came with the boat, but then I haven't finished searching it either. So long for now.